The board said pollutants shed by the ships into Suisun Bay include mercury, lead, hexavalent chromium, PCBs and asbestos. Maritime Administration officials are showing off the cleanup work on a fleet of decaying warships in Suisun Bay. 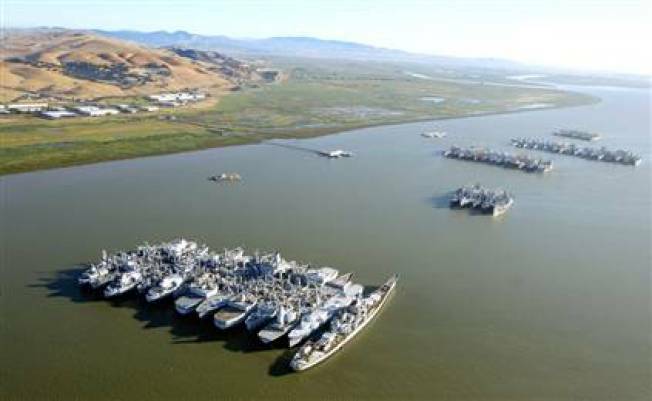 The World War II-era ships from the Suisun Bay Reserve Fleet have been sandblasted, scraped and swept as part of a settlement with environmental groups. The groups had sued, saying the ships had been polluting the waterway for decades. The Maritime Administration hired contractors for the cleanup and plan maintenance sweeps every 90 days. Officials are offering tours this week to local leaders, regulatory agencies and representatives of state and federal legislators. The lawsuit settlement also calls on the federal agency to remove 28 of the fleet's worst polluters by 2012. Ultimately, 52 vessels will be gone by 2017, leaving only a handful in Suisun Bay.